China’s difficulties have caught Japan off-guard. The land of the rising sun is highly sensitive to its larger neighbour’s economic health, which is now uncertain. Market turmoil has also sent investors rushing back into the yen, threatening profit and prices. For policymakers already struggling to battle deflation and stagnation, the jitters could hardly have come at a worse time. The People’s Republic is one of Japan’s biggest export markets, accounting for 18 percent of overseas sales. That makes Japan look less exposed than commodity giants like Australia – but far more so than Western economies such as the United States or Germany. If anything, though, export figures understate the links between Asia’s two largest economies. If China slows, so do other emerging Asian countries – big buyers of Japan’s rice cookers and air conditioners. Reduced demand from abroad also prompts Japanese businesses to rein in investment, further curbing growth. In total, HSBC economist Izumi Devalier estimates a 0.5 percentage point drop in China’s growth rate nowadays knocks 0.4 percentage points off its neighbour’s pace of expansion, which is much slower to begin with. Foreign exchange creates another problem. A weaker yen is crucial to Prime Minister Shinzo Abe’s economic turnaround plans. Epic bond-buying by the Bank of Japan has helped to devalue the yen from less than 80 versus the dollar to more than 120 in about three years, goosing the economy and handing record earnings to the country’s export-led corporate sector. But when markets are as choppy as they have been this year, the yen becomes a safe haven. Thus far the move is contained, with the currency still above 117 to the dollar. But further strengthening could curb export earnings and make imports cheaper, creating fresh downward pressure on prices. 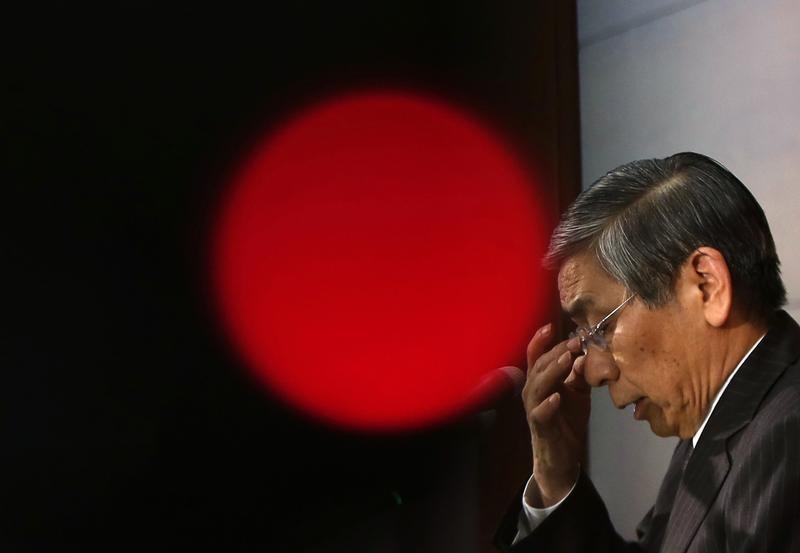 The trouble is that the BoJ is already running pretty much at full tilt, buying bonds worth an incredible 80 trillion yen ($680 billion) a year. It appears reluctant to go further. Expanding the programme could leave the central bank short of bonds to buy. Alternatives like handing out cash, buying stocks or taking interest rates negative would be controversial and not necessarily effective. The highly indebted government also has little appetite to cut taxes or boost spending instead. Tokyo must hope things in Beijing are not as dire as the sceptics claim. The yen stood at 117.57 to the dollar by noon Tokyo time (0300 GMT) on Jan. 12, compared with 121.02 a month earlier. The Nikkei 225 index of major Japanese stocks was down 2.1 percent to 17,323, meaning it has fallen 9 percent since the start of the year.